A nudge beats a shove when it comes to fostering student achievement—but it’s the human touch that matters most, according to Ben Castleman, director of UVA’s Nudge⁴ Solutions Lab and co-developer of the newly unveiled Nudges, Norms, and New Solutions program. 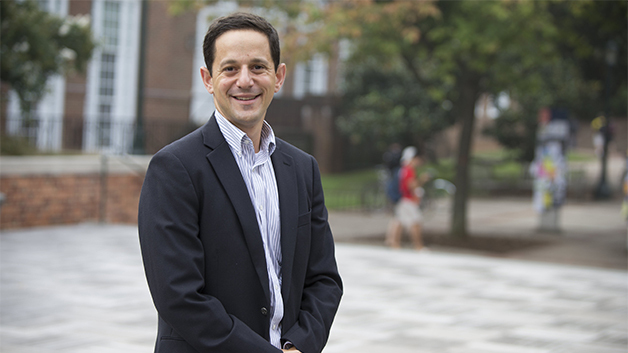 The Nudge⁴ Solutions Lab is housed within EdPolicyWorks, a collaboration between UVA's Batten School of Leadership and Public Policy and the Curry School of Education. “It’s a great way to empower people who are already taking initiative, to say, ‘Let’s build on your success, and give you something of a road map for how you might refine and improve on further strategies you create,’” Castleman said of the newly expanded approach. Castleman and his colleagues first gained national attention for innovative work with former First Lady Michelle Obama’s Up Next campaign emphasizing mobile messaging to guide students toward degree completion. But now they’re expanding their coaxing and coaching to include resiliency and responding to adversity, borrowing and repaying student loans, and warnings on how to avoid pitfalls that lead students to drop out, among other topics. “I think it’s really important to extend it beyond getting students into college, getting students to stay, getting students to come back their second year. Most of our work now is getting students to finish (college)—and when they finish, getting them into well-matched jobs,” said Castleman, Associate Professor of Education and Public Policy who holds a joint appointment at Batten and Curry. Though nudging is often associated with just text-messaging reminders, the Nudges, Norms, and New Solutions approach works with educators to devise effective behavioral strategies and customized approaches for specific efforts to encourage students. The free 98-page guide covers dozens of topics and includes references to statistically proven approaches, especially for students of color from and those from low-income families. Part the new toolkit, as Castleman and others call it, is access to specialists through a hotline, with answers within 48 hours of an e-mail message, phone call, or web form submission. For one client, that means devising effective text messaging for recent high school graduates to support them in enrolling in college in the fall. “We’re working with that person to customize a set of messages to work in their context,” Castleman said. Katharine Meyer, an Institute for Education Sciences pre-doctoral fellow in Education Policy studies at Curry and a Batten MPP graduate, said that the hotline discussions can help counselors and others figure out what specific issues they need to address first. Meyer helped develop the Nudges, Norms, and New Solutions guide with Castleman and others, and she has also been one of the co-instructors—with Castleman and Andy Rotherham, an adjunct faculty member at Curry—in the Curry course “What the Innovators Do: Strategies to Transform the Lives of Youth.” Some of the students she taught in the course are now research assistants in the Nudge⁴ Solutions Lab. With the guide, Meyer said, “We’re really trying to make it easier for people to quickly understand a whole wide range of what works in education. “I have no doubt that any school counselor would be able to read the original research report and understand it, but I don’t know that they necessarily have the time to do that. Nudges, Norms, and New Solutions benefits not only from its association with Obama’s Reach Higher college initiative, but also ideas42, a behavioral science nonprofit organization. The Heckscher Foundation for Children is funding the guide and hotline. Underlying these efforts is a deep trove of research and writing. Nobel Prize winner Richard Thaler’s co-written 2009 book Nudge: Improving Decisions About Health, Wealth and Happiness is cited by many who study and apply behavior principals. Castleman’s works include Summer Melt: Supporting Low-Income Students Through the Transition to College, co-written with Lindsay C. Page, and The 160-Character Solution: How Text Messaging and Other Behavioral Strategies Can Improve Education. “I never want to presume that I know what is optimal for each individual,” said Meyer. “I never want to say that I know what’s right for” a student who returns home after a year at college, “that they go back from school over the summer and they have interactions with their family and they decide that it is really best for them to be in their community. Castleman said, “As best as we can, we want to help people follow through on their own intentions, and we want to help people be aware of and knowledgeable about all of the opportunities that are available to them. “The guiding principles for us are: help people follow through on their intentions, help people understand their options, help people understand the resources that are available to them—but leave it to the individual and their loved ones to decide what’s the best path; don’t presume that we know that for people. “It’s part of a solution to bring awareness and the use of evidence-based strategies to a wider set of educators,” Castleman said.